Apple TV effectively allows you to stream whatever is on your iTunes to your TV and home theater system. Moreover, it has built in support for Netflix, You Tube and a few other internet based media content providers. The picture quality and performance for these services are worth the price of admission. There is significant potential to advance the platform – just give it some time. Set Up: Easy as pie. It took five minutes to plug in the HDMI cable, the optical cable, the power outlet and then adding it to the wireless network. Sharing iTunes from my desktop to Apple TV took another 20 minutes, since I had to download the new version of iTunes and restart my computer and Apple TV. Apple really makes it easy – I didn’t have to make any adjustments to my firewall settings to share iTunes on the desktop with Apple TV. I also downloaded the Apple Remote on my iPhone and iPad, which took another 5 minutes. User Interface: Apple’s secret sauce is the simplicity of their products. Apple TV is no different. The menu is very simple – Movies, TV, Internet, Computer and Settings. Movies and TV are for renting content directly from iTunes within Apple TV. Internet gives you access to Netflix, You Tube, etc. Computer gives you access to iTunes on your computer. Settings allows you to change the various Apple TV options. The remote control is Apple’s usual model of minimalist efficiency, with a menu button, a play / pause button and an iPod like controller. The supplied remote works well with Apple TV, but is a bit cumbersome when one has to enter data (e.g., e-mail addresses, search on YouTube or Netflix). A much better solution is downloading Apple Remote on your iPhone or iPad. It basically turns the iPhone or iPad into a big touch pad that allows you to use gestures to control the Apple TV (e.g., swipe left, swipe right, double click, etc.). Moreover, it automatically provides a keyboard when one is asked for text input (e.g., for search). Apple remote is free on the App Store. Netflix Streaming / Video Quality: Setting up Netflix was quick – basically just enter your e-mail address / password and you’re ready to go. I watched some TV from BBC, a foreign flick and Iron Man. Each program loaded quickly – less than 30 seconds. Picture quality was good to great, depending on the source material. Picture quality was comparable to DVD for SD material(perhaps slightly better), but slightly less sharp than upconverted DVD or blue-ray. HD Programming looked like the HD on-demand programming through uVerse. There was enough of a buffer that there was no jittering, pixelation or stuttering on the streaming to the TV. Sound quality on the stream was good – I don’t think they stream in 5.1, so the video stream doesn’t leverage the subwoofer. Considering that I’m running a heavily taxed wireless system on 802.11g with a 100 foot distance between Apple TV and the Gateway, the picture quality and streaming performance are impressive. Having this quality of Netflix compatibility is worth the price of admission by itself. iTunes Streaming: I streamed some music from my Playlists from the Computer. Sound quality is good, but not great. My Yamaha CD Player sounds better, but it can only hold 5 cds. Having access to my entire library is very useful, so you lose sound quality but gain convenience. iTunes streams not only the music, but also the cover art. After a few minutes, Apple TV switches into screensaver mode and starts transmitting pictures to the TV along with the music. I also streamed some videos from my computer and the streaming was again flawless. One of the issues with Apple TV is that it only supports the Apple video standards, i.e., MP4. I had some DIVX files that I converted over to MP4 by using DVD Fab and imported them into iTunes. So if you have a library of AVI, Divx, Xvid, etc., this will require conversion of those files in order to stream from your computer. iTunes from within Apple TV: There is access to an iTunes store within Apple TV as well. They have a different pricing structure, in that TV shows and movies are available for rent only. They have a limited number of titles at this point – primarily BBC, ABC (since Steve Jobs sits on their Board) and Fox. CBS and NBC are not on Apple TV. Movie selection is decent – they have all the latest movies. The Apple TV selection can be easily increased by just downloading the content you want from iTunes on your desktop and then streaming it to Apple TV. YouTube Streaming: Surprisingly good. The HQ / HD You Tube pieces look remarkably crisp on the TV. The older content that was meant to watch on a small window on your computer looked a little pixelated, but acceptable. Apple has built a great platform with a lot of potential. With what is available right now – Apple TV is a pretty impressive value at $99. It is worth it just for the Netflix streaming and integration with iTunes. Since Apple TV is actually built on the same hardware (at least the processing chip) as the iPhone and iPad and has the same operating system, I wouldn’t be surprised if there are “apps” that will eventually make it to Apple TV to further enhance Apple TV (e.g., ABC Streaming, Games, Amazon on Demand, etc.). There is supposed to be an upgrade to the operating system with a new version of Airplay that comes out in November, 2010. This will allow you to stream from an iPad or iPod to the Apple TV as well. I looked at other streaming devices (e.g., Roku, using my Panasonic Blue Ray for Netflix, etc.) and none of them had the simplicity and reliabilty that the Apple TV offers. The Wi Fi “stick” for my Blue Ray player is $80 anyway and the Netflix integration isn’t anywhere nearly as robust as Apple TV. UVerse also has music and picture streaming built in using Microsoft Media Center – however, it required some network configuration and it crashes quite often. I didn’t purchase a Roku, but a friend of mine has had a number of issues with streaming performance. 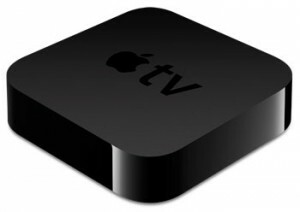 At under $100, the Apple TV is competitively priced with other streaming options. Now just bring on the “apps”.